The village of Saint-Leon-sur-Vezere is in the Vezere valley, halfway between Montignac and Les Eyzies. Well worth finding if you are in the area, it is classified as one of the most beautiful villages of France. France This Way comment: Saint-Leon-sur-Vezere is a charming little village on a curve in the river, with a cluster of honey-coloured old houses joined by small alley ways. It is true that the village is small, and some of the most lovely buildings are raher hidden behind hedges, but a visit is still very enjoyable. The lovely church in Saint-Leon-sur-Vezere is in the roman style with meticulously repointed stonework and surrounded by a manicured lawn and is very picturesque. The church is one of the oldest in the Perigord region and dates from the 12th century when it was built on existing gallo-roman foundations. Traces of these gallo-roman walls can be seen on the river side. The church is built in the shape of a cross and has a wonderful two-storey square bell tower. Its roof is covered in lauze which are flat stones and whilst they were common in the region not many now remain. Inside the church you can see the remains of some frescoes. Every year a classical music festival takes place in the church at Saint-Leon-sur-Vezere. There are a few cafes and restaurants on the 'main road' at the edge of the village, and one or two arty crafty pottery type places. There are two chateaux in the village. In the centre of Saint-Leon-sur-Vezere the beautiful Chateau-de-Clerans was built in the 16th century on the site of a 12th century mansion. The chateau is private but if you follow the path along the edge of the river a short distane way you get some great views of the castle. On the edge of the village you can visit the large and impressive Chateau de Chabans. 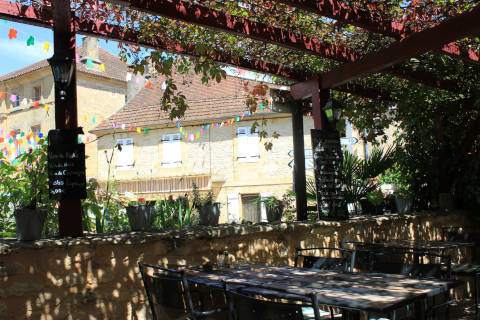 It is in a lovely setting with attractive French style gardens, and has been carefully restored over the last 16 years. Inside it has some notable tapestries and a fine collection of stained glass windows. 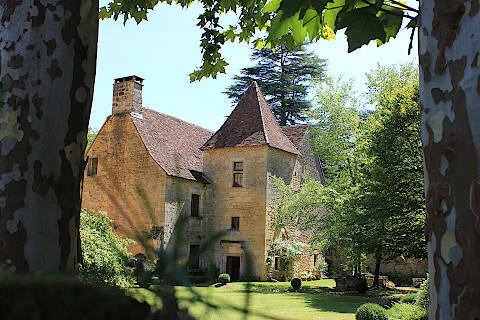 As well as these two castles there is also a large manor house in Saint-Leon-sur-Vezere, called the Manoir de la Salle. That really does make a lot of impressive buildings for such a small village! Take a look at the cemetery at the entrance to the village. This contains some impressive 'enfeus' which are tombs built into the walls of cemeteries (or churches). The ones at Saint Leon sur Vezere were moved to their current position in 1846 as they used to be next to the church and were prone to flooding. 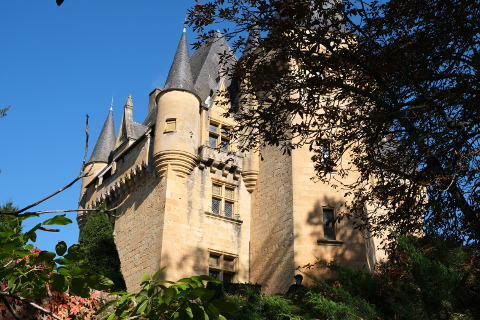 It will only take about an hour to explore St-Leon-sur-Vezere properly, leaving you plenty of time to have lunch in one of the restaurants in the village, or have a picnic on the river banks. Throughout the Vezere Valley you can explore old caves, troglodyte dwellings, and remnants of prehistoric man. The renowned Lascaux Caves are also close by. For the children there are plenty of 'dinosaur parks' etc, and for all the family there is canoeing on the Vezere itself (canoes can be hired in the village).